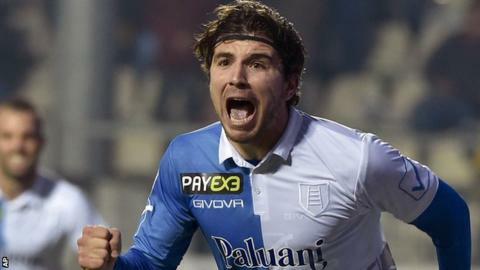 Swansea City have signed former Italy Under-21 striker Alberto Paloschi from Italian side Chievo for an undisclosed fee, believed to be about £8m. The 26-year-old, who scored eight goals in 21 Serie A games this season, has signed a three-and-a-half-year deal and will wear Swansea's number nine shirt. "Alberto Paloschi was my player when we worked together at Parma," said Swansea head coach Francesco Guidolin. "He can play well in the Premier League because he is strong. I like him." Swansea, who are just four points above the Premier League relegation zone, are the joint second lowest scorers in the Premier League, with just 22 goals in 23 games this season. Paloschi started his career at AC Milan and has also played for Parma and Genoa. He joined Chievo in 2011 and has scored 42 goals in 144 Serie A appearances. He has represented Italy at under-21 level, scoring in their 2-1 defeat by Wales at Swansea's Liberty Stadium in 2009. He lined up alongside the likes of AC Milan's former Liverpool forward Mario Balotelli in a game won by Aaron Ramsey's spectacular strike. Paloschi's move sees him link up with compatriot Guidolin, who was appointed Swans head coach earlier this month. "He was a promising player," said Guidolin. "He is a good player, a good guy. I think he is important for us and can help the team to have results and score many goals, I hope." Former Udinese manager Guidolin guided the Swans to a 2-1 win at Everton in his first game in charge, the Welsh club securing back-to-back victories for the first time this season having previously beaten Watford. Swansea are 15th in the Premier League table, with only bottom side Aston Villa scoring fewer goals in this campaign.